Rent this post-modern, spacious, upside down house with 5/6 bedrooms, 5 bathrooms overlooking Lake Montauk. This home is located just off the prestigious and scenic East Lake Drive. Young almost 4,000 square foot home with Southwest exposure offers unprecedented sunset views off the back decks on both levels of the home. The fully equipped kitchen boasts cherry cabinets, Corian counter tops and island, and a Viking stove with griddle. The upper level back deck has a large outdoor barbecue grill. The living room and family rooms both offer gas fireplaces, beautiful mantles, and hard wood floors. The master bedroom suite includes a large bedroom, walk in closet and a good sized bathroom with a Jacuzzi tub. The house has 3 other queen sized bedrooms and 2 bedrooms with twin beds, and a huge playroom. The house also has a dining room, living room and family room. Low off-season rates. The home offers central air, many closets, a separate laundry room with large capacity washer and dryer, cable TV, DVD and VCR players, and too many amenities to list. 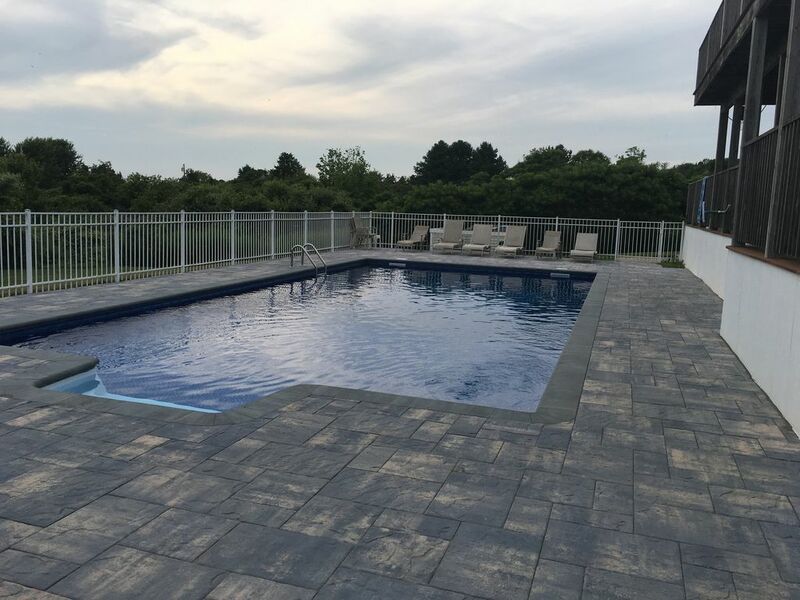 This home offers a terraced, heated 20x40 in ground pool. outdoor shower and 1 car garage complete this beautiful home. Located a short bicycle drive from Gin Beach and Ditch Plains beaches. Available monthly or full season, extended season too! Great for 2-3 families to rent. All kitchen equipment and linen is provided. Pack your clothes and enjoy your vacation! We chose to build our home on this site because of the spectacular view. This well appointed home is spacious and allows for a large group to enjoy their vacation. Stunning sunset views every night! The house is huge, beautiful pool, and exceptional views from the balcony! The only thing to remember is bring your own beach towels as they do not provide. It's a short drive to town, the beach, and right around the corner from gorgeous Crow's Nest. We'd definitely rent again! The property was in fantastic shape, and the house was very nice and had more than enough room for 10-12 adults to sleep comfortably. The heated pool and second level deck with bbq were tremendous pluses. The location was great too -- it was very close to everywhere my friends and I wanted to go. Also, the homeowners were a pleasure to deal with; they were very responsive, honest, and reliable. I really cannot say enough positive things about the experience I had here. My friends and I had a wonderful weekend in Montauk, and the house really made the trip! If you have a nice sized group and are looking for a place to stay, look no further!! Thanks Jason Glad you were able to enjoy our home. Stayed here with our family last summer. Cannot say enough great things about this house. The house was clean, well maintained, a nice layout and large enough to accomodate all of us. We truly felt at home. Our family made so many wonderful memories here and in surrounding areas. Playing in the pool, enjoying the sunset off the back deck, barbeque, fishing and so much more. We would love to do it again this year too!! Thank you so much and I will recommend it to all my friends and extended family!! Thank you for your lovely review. We strive to provide our renters with a clean home and a great place to create lasting family memories. There is something so serene about sitting on the deck and enjoying the daily sunsets! We look forward to having you return to our Montauk home. This is a home that we have rented 2 years in a row. It is spacious and very clean with a great kitchen.There is plenty of space for parking... we had 14 people staying and there was more than enough space to feel comfortable. The backyard is quiet and peaceful, with multiple decks and a beautiful heated pool. The top deck has a great view, especially at sunset... truly breathtaking! Friends who had stopped by during our visit, were interested in renting as well. It comes highly recommended. We had the oportunity to stay in the house with 4 other couples and some children. There is so much room for larger groups. The kitchen makes it easy to accomodate large meals. Having a heated pool is a big hit with children. Your location in Montauk showcases how beautiful a spot it really is out there. Thanks. Bicycle ride to town, beaches, lighthouse and horseback riding. Car/taxi ride to nearby fishing, boating, and golfing at Robert Trent Jones designed Montauk Downs State Park 18 hole golf course (rated in top 50 US public golf courses). Hiking, horseback riding, shopping, dining, sightseeing, miniature golf.